One person has died following a mid-air engine failure aboard a Southwest Airlines Boeing 737-700. Southwest flight 1380 was en route from La Guardia in New York to Dallas Love Field airport on the morning of April 17 and was diverted to Philadelphia International Airport (PIA) when the aircraft lost its left-side engine. From images of the aircraft on the tarmac, it is clear a window is blown out about 10 windows back from the front-edge of the engine's cowling. 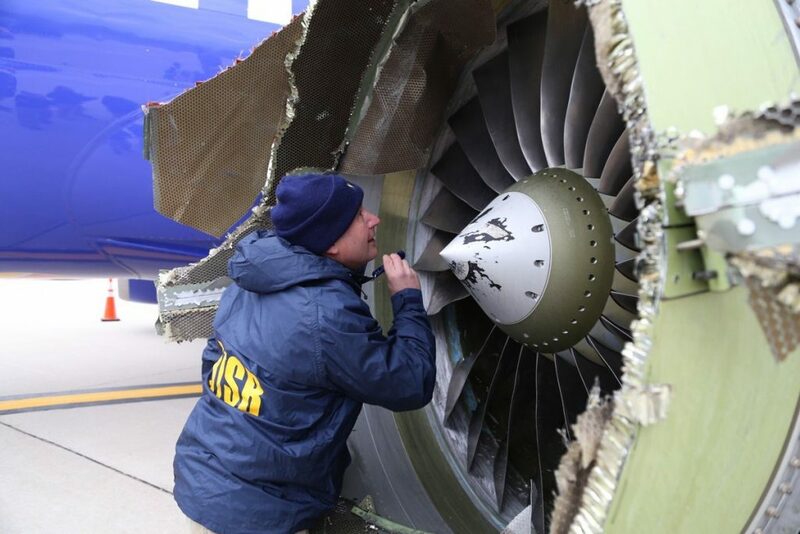 Later in the day, after arriving at the scene, Sumwalt told reporters a preliminary examination of the aircraft revealed that one of the engine's 24 fan blades was missing. “This fan blade was broken right at the hub and our preliminary examination of this was that there’s evidence of metal fatigue where the blade separated.” He added that a piece of the engine's cowling was found in Bernville, Pennsylvania, about 70 miles northwest of the Philadelphia airport, and that investigators will also be looking for any possible relationships with what happened in 2016 over the Gulf of Mexico. Flightradar24, a Swedish Internet-based service that shows real-time aircraft flight information, reports the 737-700 involved in the April 17 incident was delivered to Southwest Airlines in 2000 and that the aircraft is powered by two CFM56 engines. FlightRadar24 estimates the 737-700 descended from 31,684 feet to about 10,000 feet in a little over five minutes. The flight had 143 customers and five crewmembers onboard. The flight crew is being praised for making the emergency landing in Philadelphia, which, according to the New York Post and other news outlets, was piloted by Tammie Jo Shults, 56. Shults, explains the Post, was one of the Navy’s first female fighter pilots and also among the first to pilot a supersonic F/A-18. In its third public statement on April 17, Southwest Airlines announced that it is accelerating its existing engine inspection program relating to the CFM56 engine family. “The accelerated inspections are being performed out of an abundance of caution and are expected to be completed over the next 30 days. The accelerated checks are ultrasonic inspections of fan blades of the CFM56 engines."